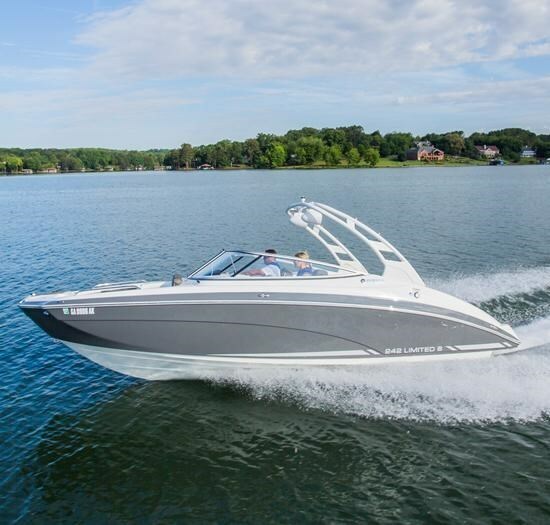 The 242 Limited S is the flagship of Yamaha’s four model lineup of all-new for 2015 24-foot Sport Boats. 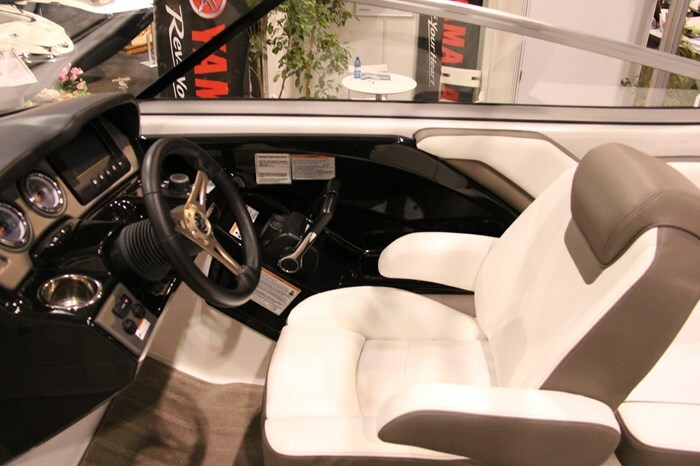 In all, Yamaha offers twelve models of single and twin engine jet drive sport boats in three sizes; 19, 21, and 24 feet. 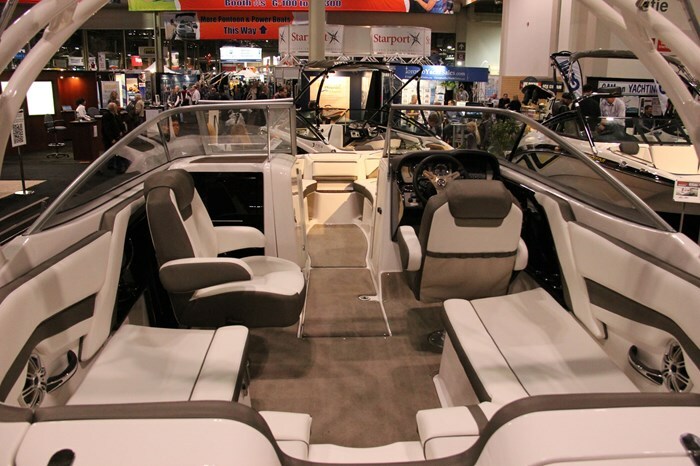 Yamaha redesigned its four 24-foot models with, “A completely new hull and deck design that’s longer with higher freeboard and higher bow lines.” The length overall of this new 242 Limited S has increased a full six-inches over last year’s model and the hull’s dry weight is up almost two hundred pounds, partially due to this increase in length and no doubt partially due to the increase in freeboard (distance from the waterline to the top of the gunwales). 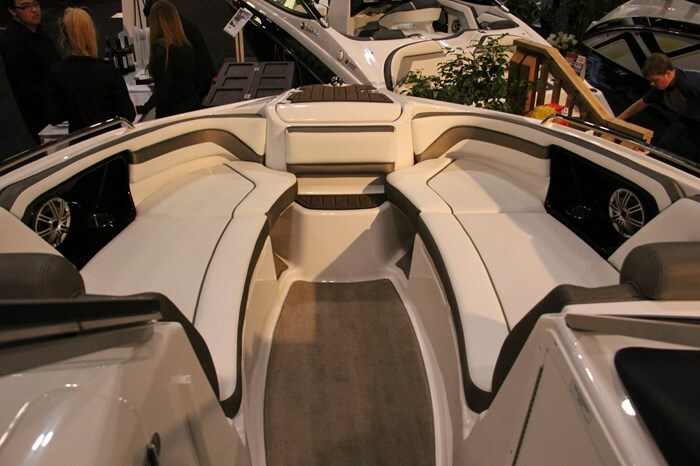 In designing and building this new hull, Yamaha has incorporated its “Quiet Cruise” technology which it describes as “A bold leap forward in sound suppression,” involving, “An innovative sound suppression system that controls the amount of engine noise and vibration that enters the cabin.” This new boat rides on a commendably deep-vee 20-degree deadrise hull bottom. Along with many refinements that Yamaha has made to its new twenty-four footers, one of the most outwardly noticeable are the changes to its two level integrated swim platform. The lower level of this platform is once again very close to the water level when the boat is at rest with a centre-mounted underslung stainless steel telescoping boarding ladder. These are great features for watersports enthusiasts. 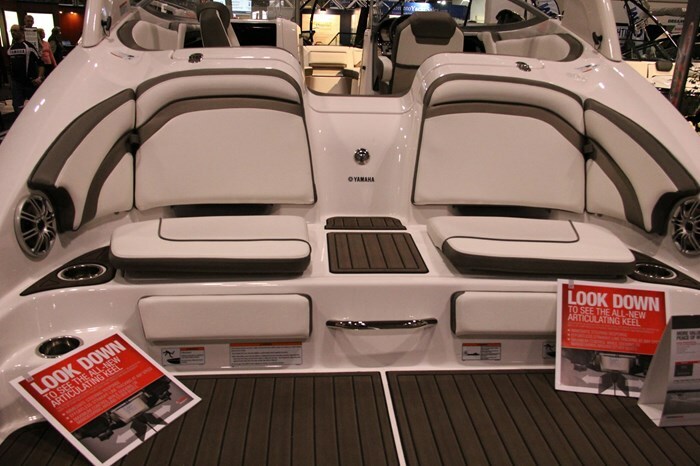 The upper step of this full-width platform includes two rear-facing seats with seat cushions, padded calf supports plus cushioned backrests with additional wet storage compartments behind these backrests plus a 12-volt receptacle and a centre-mounted ski-tow ring. Also included are a couple of drinkholders plus a pair of Polk® speakers, a stereo remote, SeaDek® matting on both upper and lower surfaces, fresh water shower, wet storage within the step with jet pump cleanout ports, plus a side-mount bracket to accommodate the portable dinette table. 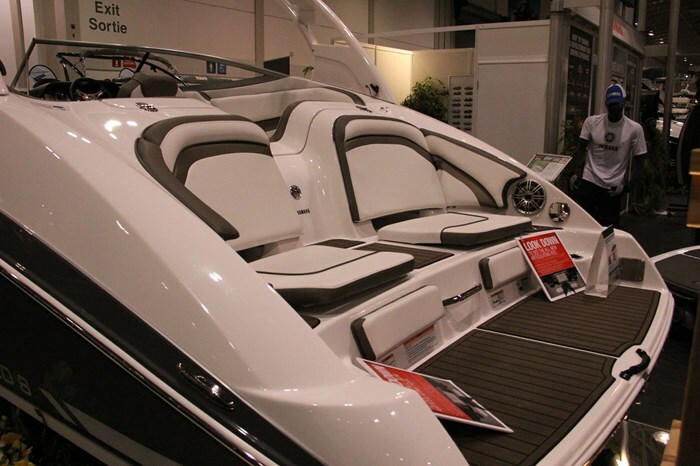 The cockpit of the 242 Limited S offers full U-shaped seating with hinged seat cushions with storage beneath plus a centre transom walk-over to the swim platform. Snap-in “Teak-style” carpet is standard equipment as is a removable cooler with dedicated storage. The standard removable dinette table can be mounted to serve the cockpit or on the swim platform. Twin swivel adjustable reclining high-back captain’s chairs with armrests and built-in headrests welcome the driver and front passenger. The driver’s chair has a flip-up bolster. Ahead of the passenger on the port side is an entertainment centre with lockable glovebox and a fold-down table with dedicated built-in drinkholders. This entertainment centre is itself built-into an interior upholstered enclosed head compartment / change room. A walk-thru bow door leads through the centre-opening windshield to the commodious bow seating of port and starboard curved lounges with built-in backrests on both helms. 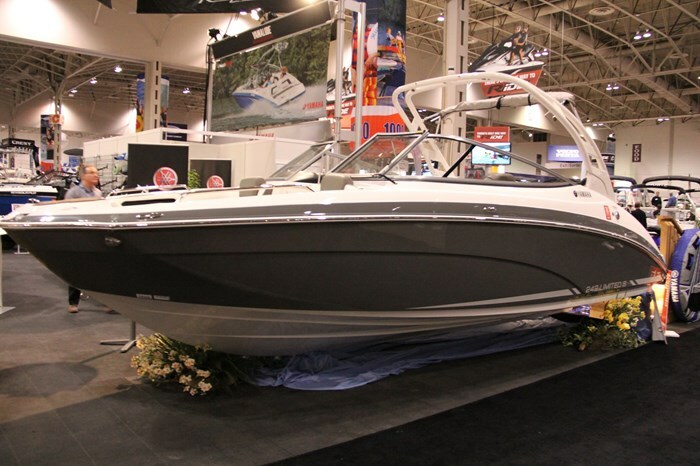 A centre step up to the large bow area provides access to the forward recessed anchor locker with a built-in concealed and telescoping bow boarding ladder. Bow filler cushions are standard as are docking lights. 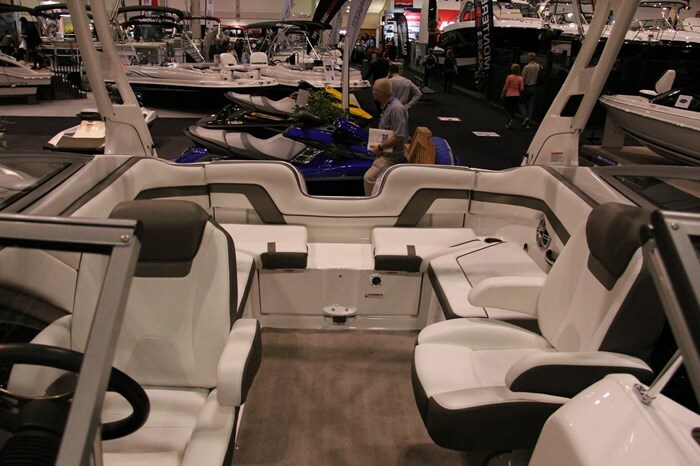 Since this is the most upscale 242 Limited S, it is standard equipped with a forward-swept aluminum folding wakeboard tower in white or black depending on your choice of hull colour and equipped with two flush-mounted tweeter speakers plus five flush-mounted LED lights. 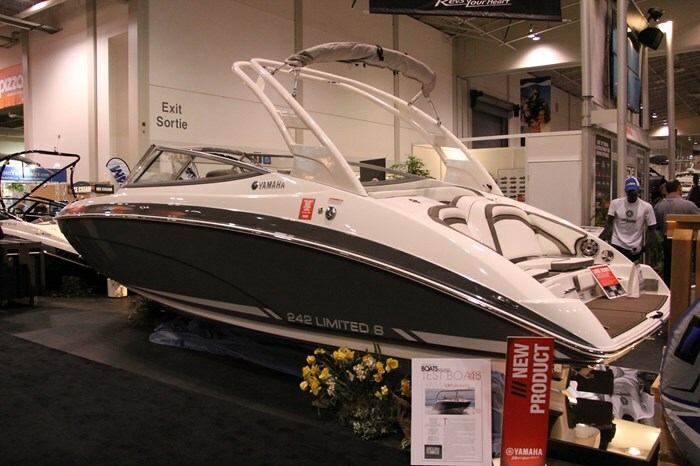 One of the only factory options available for this unusually well-equipped boat are wakeboard racks for this tower. The helm of the 242 Limited S is similarly well equipped. Tilt steering is of course standard but the highlight is Yamaha’s Connext™ all-in-one LCD touchscreen helm control system with joystick controls. 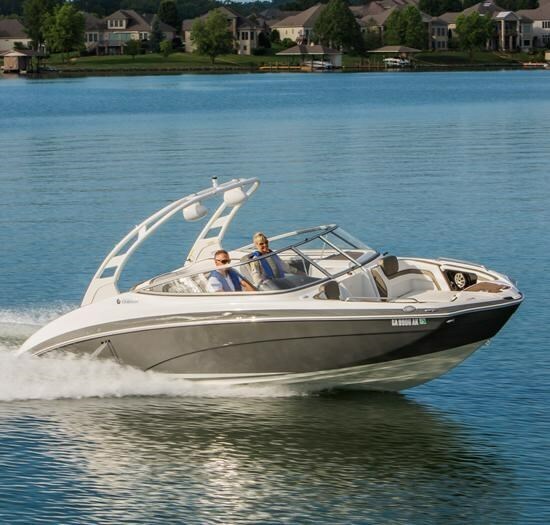 Also included is Yamaha’s three-position No Wake Mode™ Control with cruise assist. An electronic speedometer, fuel management system, compass, and depth finder are also standard. Standard entertainment is from a Polk® marine stereo with Bluetooth® capability, USB input, wireless remote, and a total of eight speakers including the two on the tower.